A method has been developed to isolate and record the existence of certain sub-micron particulates that appear to be resident within the atmosphere. 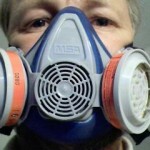 The evidence from this research continues to support the claim of high levels of extremely fine metallic salts within the atmosphere as a consequence of the aerosol operations. The method developed incorporates a combination of ionization collection, electrolysis for separation, and significant advances in microscopy that have been made with relatively modest means. A significant chemical reaction demonstrating the presence of metallic ions from the atmospheric sample is presented. 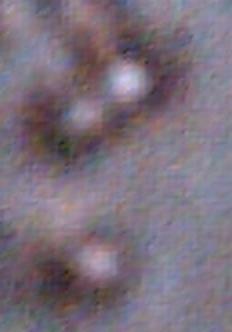 The presence of the fibrous and powder/crystal photographed below was called to my attention in early January by a resident of Santa Fe, New Mexico. The filtration system within the house uses three Ionic Breeze Electrostatic Air Cleaners (Model number 51637) manufactured by Sharper Image. This resident pays careful attention to the state of cleanliness of the house and filter system, and an unusual coating was observed to exist on a plate ionizing air filter after an absence of several days. After cleaning, an identical condition occurred again after a second absence. Acting upon a request, I therefore made a direct visit to the residence to view the sample. The light coating was not obvious to a casual observer, but was discernible and beige in color. 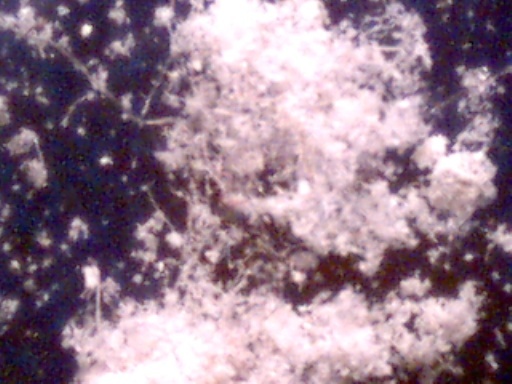 Over a period of a couple of weeks, samples of the material were accumulated and have been placed under the microscope. 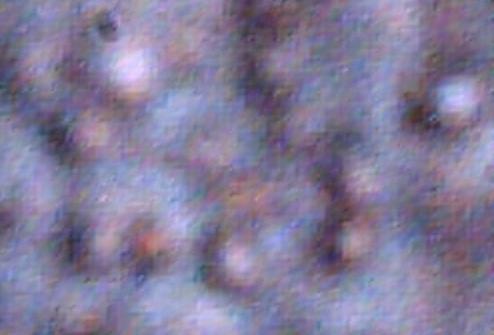 The results of that session at magnification levels of 60x and 200x follow. The material is unusual in that it is fairly uniform in composition, and consists of two primary materials: powder/crystals and fibers. 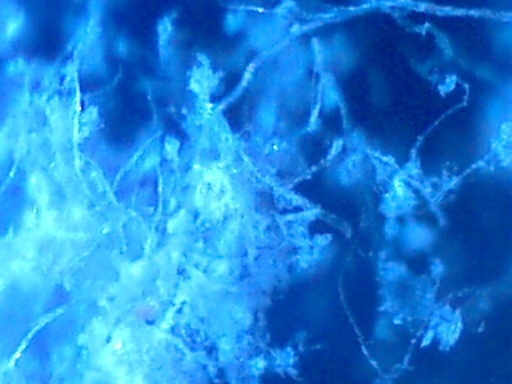 The fibers are translucent to white, and are surprisingly uniform in their general nature. They do not appear to resemble textile or animal fibers in any way because of the uniform nature, size and color. There is no known source within the residence to explain the origin of these two materials. Close observation of the filtration system by the resident is a likely factor in the discovery of this material. The material has now been placed into solution and subjected to electrolysis. A significant chemical reaction does occur. It is apparent from the level of electrolytic reaction that occurs that a metallic salt is a dominant component of the material. A highly insoluble precipitate forms as a result of this reaction; a record of this event is also shown below. The copper electrodes do not appear to be highly significant in the reaction, but they do appear to be a factor in the final bluish tint to the precipitate that forms. The insolubility of the precipitate is a dominant factor in the identification process. Subsequent observations will more carefully analyze the effect of the electrolysis upon the fibrous materials. Readers are referred to an earlier paper1 of May 27 2002 entitled “Electrolysis and Barium” as a precedent to the current research. It will be recalled within that paper that an outdoor filtration system was used to collect the solid materials over a six week period, and the solids subsequently placed into solution. The current method of ionization appears to be a more direct and rapid method of accumulating the solid material forms, as the final results are identical in both cases. 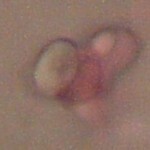 Advances in microscopy also provide a significant and new benefit. Two years have elapsed since the earlier progress, and this delay continues to point out the need for additional resources, expertise and activism to progress with disclosure on the aerosol issue. Approximately 45 minutes into the electrolysis process. Fibers have risen to top of distilled water. Approximately 24 hours into the electrolysis process. 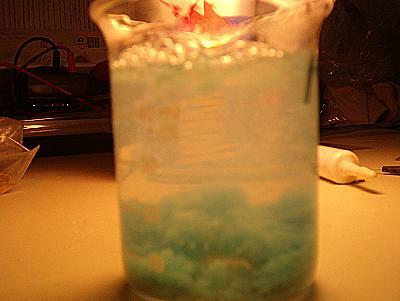 Significant precipitate formation at bottom of container. 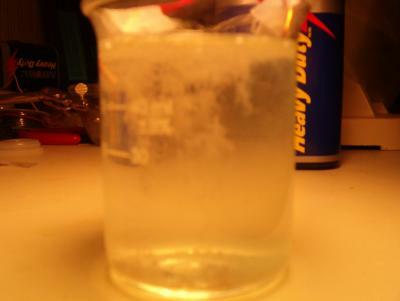 Solubility tests have also been conducted on the precipitate that forms from the electrolysis reaction. The results of this testing, including the use of distilled water, hydrochloric acid, sulfuric acid and ethanol again point to the likelihood of an identical precipitate2 being formed in this case. The precipitate is highly insoluble in water, insoluble in weak hydrochloric acid, insoluble in ethanol and slightly soluble in weak sulphuric acid. The best analysis that exists at this time continues to point to the formation of a barium sulphate compound. It is not to be concluded that barium sulphate is an original atmospheric compound; the compound forms as a result of electrolysis. A reasonable supposition that can be made with current and former information available is that high levels of a barium or metallic compound exist within the atmosphere, and that this compound leads to ion formation within solution or water. In addition, testing with sodium hydroxide leads to a white precipitate being formed (close examination required); this along with the electrolysis does indicate the presence of a metallic cation within the solution, regardless of any final identification that is to be made3. In summary, the current research involves a process of collection of atmospheric samples with the use of a plate ionizing filter. This material is unusual in nature and is composed of two primary forms : fairly uniform fibrous and crystalline/powder material. This material has been collected, placed into solution and subjected to electrolysis. A definite and repeatable chemical reaction does take place, which results in the formation of a highly insoluble precipitate. The best current analysis of that material positively identifies the existence of a metallic salt. The best analysis of the nature of that metallic salt is that of a barium compound which releases positive metallic ions in solution. 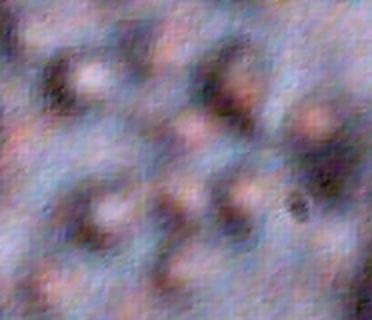 In addition, direct visible observation of the precipitate under extremely high magnification detects the presence of reasonably uniform spherical sub-micron particulates within the electrolysis result. The specific gravity of these particulates is greater than that of water. The microscope technique developed combines an analog oil immersion microscope rated at 1000x with a digital camera addition that was originally applied to astrophotography. This microscope now provides views which can be recorded at 1000x, 4000x and 10,000x; these levels far exceed conventional visible light microscopy limits of 1000x to 2000x, and materials at the 2 micron size range. It has long been postulated that the size of the aerosols under examination is in the sub-micron range, and that extremely high magnification will be necessary for detection. The size range of the aerosols has previously been estimated at approximately 0.5 microns in size as a result of atmospheric light effects; this conforms to the current observations. It is now hoped that citizens will begin duplicating this sampling process and obtain a positive identification of the materials that have been isolated. A justifiable case for analysis and identification of the metallic based materials by private professionals and by public and government environmental and health agencies is well established, and citizens are asked to pursue that goal in earnest. 2. 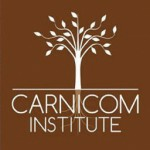 Carnicom, May 27, 2002. 3. Lawrie Ryan, Absorb Chemistry for GCSE by Lawrie Ryan, Testing for Ions, (http://www.crocodile-clips.com/absorb/AC4/sample/LR).